In this post, I will describe a technical methodology we used to remove a piece of functionality from a Monolith/Service and turn it into a Micro-Service. I will try to reason about some of the decisions we have made and the path we took, as well as a more detailed description of internal tools, libraries and frameworks we use at Outbrain and in our team, to shed some light on the way we work in the team. And as a bonus you might learn from our mistakes! Let’s start with the description of the original service and what it does. Outbrain runs the largest content discovery platform. From the web surfer’s perspective it means serving a recommended content list that might interest her, in the form of ‘You might also like’ links. Some of those impression links are sponsored. ie: when she clicks on a link, someone is paying for that click, and the revenue is shared between Outbrain and the owner of the page with the link on it. That is how Outbrain makes its revenue. My team, among other things, is responsible for the routing of the user to the requested page after pressing the link, and for the bookkeeping and accounting that is required in order to calculate the cost of the click, who should be charged, etc. In our case the service we are trying to split is the ‘Bookkeeper’. Its primary role is to manage the paid impression links budget. After a budget is spent, The ‘Bookkeeper’ should notify Outbrain’s backend servers to refrain from showing the impression link again. And this has to be done as fast as possible. If not, people will click on links we cannot charge because the budget was already spent. Technically, this is done by an update to a database record. However, there are other cases we might want to stop the exposure of impression links. One such an example is a request from the customer paying for the future click to disable the impression link exposure. So for such cases, we have an API endpoint that does exactly the same with the same code. That endpoint is actually part of the ‘Bookkeeper’ that is enabled by a feature toggle on specific machines. This ‘Activate-Impressionable’ endpoint as we call it, is what was decided to split out of the ‘Bookkeeper’ into a designated Micro-Service. In order to execute the split, we have chosen a step-by-step strategy that will allow us to reduce the risk during execution and keep it as controlled and reversible as possible. From a bird’s eye view I will describe it as a three steps process: Plan, Up and Running as fast as possible and Refactor. The rest of the post describes these steps. In my opinion, this is the most important step. You don’t want to split a service just in order to split. Each Micro Service introduces maintenance and management overhead, with its own set of challenges. On the other hand, Microservices architecture is known for its benefits such as code maintainability (for each Micro Service), the ability to scale out and improved resilience. Luckily for me, someone already did that part for me and took the decision that ‘Activate-Impressionable’ should split from the ‘Bookkeeper’. But still, Let’s name some of the key factor of our planning step. Basically, I would say that a good separation is a logical separation with its own non-overlap RESTful endpoints and isolated code base. The logical separation should be clear. You should think what is the functionality of the new service, and how isolated it is. It is possible to analyze the code for inter-dependencies among classes and packages using tools such as lattix. At the bottom line, it is important to have a clear definition of the responsibility of the new Micro Service. In our case, the ‘Bookkeeper’ was eventually split so that it remain the bigger component, ‘Activate-Impressionable’ was smaller and the common library was smaller than both. The exact lines of code can be seen in the table below. Unfortunately, I assessed it only after the split and not in the plan step. We might say that there is too much code in common when looking at those numbers. It is something worth considering when deciding what to split. A lot of common code implies low isolation level. Of course part of the planning is time estimation. Although I am not a big fan of “guestimates” I can tell that the task was planned for couple of weeks and took about that long. Now that we have a plan, let’s get to work. As in every good refactor, we want to do it in small baby steps, and remain ‘green’ all the time. In continuous deployment that means we can and do deploy to production as often as possible to make sure it is ‘business as usual’. In this step we want to get to a point the new service is working in parallel to the original service. At the end of this step we will point our load-balancers to the new service endpoints. In addition, the code remains mutual in this step, means we can always deploy the original fully functioning ‘Bookkeeper’. We actually do that if we feel the latest changes had any risk. Create the new empty Micro-Service ‘Activate-Impressionable’. In outbrain we do it using scaffolding of ob1k framework. Ob1k is an open source Micro Services Framework that was developed in-house. 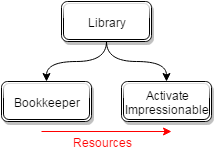 Create a new empty Library dependent both by the new ‘Activate-Impressionable’ service and the ‘Bookkeeper’. Ideally, if there is a full logic separation with no mutual code between the services that library will be deleted in the cleanup phase. Move the relevant source code to the library. Luckily in our case, there was one directory that was clearly what we have to split out. Unluckily, that code also pulled up some more code it was dependent on and this had to be done carefully not to pull too much nor too little. The good news are that this phase is pretty safe for static typing languages such as Java, in which our service is written in. The compiler protects us here with compilation errors so the feedback loop is very short. Tip: don’t forget to move unit tests as well. Move common resources to the library, such as spring beans defined in xml files and our feature flags files that defined in yaml files. This is the dangerous part. We don’t have the compiler here to help, so we actually test it in production. And when I say production I mean using staging/canary/any environment with production configuration but without real impact. Luckily again, both yaml and spring beans are configured to fail fast, so if we did something wrong it will just blow out in our face and the service will refuse to go up. For this step I even ended up developing a one-liner bash script to assist with those wicked yaml files. 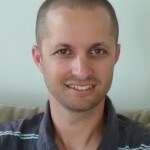 Copy and edit web resources (web.xml) to define the service endpoints. In our case web.xml can’t reside in a library so it has to be copied. Remember we still want the endpoints active in the ‘Bookkeeper’ at that phase. Lesson learned: inspect all files closely. In our case log4j.xml which seems like an innocent file by its name contains designated appenders that are consumed by other production services. I didn’t notice that and didn’t move the required appender, and it was found only later in production. Deploy Deploy the new service to production. What we did is deploy the ‘Activate-Impressionable’ side-by-side on the same machines as the ‘Bookkeeper’, just with a different ports and context path. Definitely makes you sleep better at night. Up-And-Running Now is a good time to test once again if both ‘Bookkeeper’ and ‘Activate-Impressionable’ are working as expected. Generally now we are up and running with only few more things to do here. Clients Redirect Point clients of the service to the new endpoints (port + context path). A step that might take some time depends on the number of clients and the ability to redeploy them. In outbrain we use HA-Proxy, so reconfiguring it did most of the work, but some clients did require code modifications. (More) Validation Move/copy simulator tests and monitors. In our team, we heavily rely on tests we call simulator tests. These are actually black-box tests written in JUnit that runs against the service installed on a designated machine. These tests see the service as a black-box and calls its endpoints while mock/emulate other services and data in the database for the test run. So usually a test run can look like: put something in the database, trigger the endpoint, and see the result in the database or in the http response. There is also a question here whether to test ‘Activate-Impressionable’ or the ‘Bookkeeper’. Ideally you will test them both (tests are duplicated for that phase), and that is what we did. When we got here the new service is working and we should expect no more behavior changes from the endpoints point of view. But we still want the code to be fully split and the services to be independent from each other. In the previous step we performed the phases in a way that everything remains reversible with a simple feature toggle & deploy. In this step, we move to a state where the ‘Bookkeeper’ will no longer host the ‘Activate-Impressionable’ functionality. Sometimes it is a good idea to have a gap from the previous step to make sure that there are no rejections and backfires that we didn’t trace in our tests and monitoring. And now we just have to push the sources and the resources from the library to the ‘Activate-Impressionable’ service. In the ideal case there is no common code, we can also delete the library. This was not how it was in our case. We still have a lot of common code we can’t separate for the time being. Now is also the time to do resources cleanup, web.xml edit etc’. And for the bold and OCD among us – packages rename and refactor of code with the new service naming conventions. The entire process in our case took a couple of weeks. Part of the fun and advantage in such process, is the opportunity to know better an old code and its structure and functionality without the need to modify something for a new feature with its constraints. Especially when someone else wrote it originally. In order to perform well such a process it is important to plan and remain organized and on track. In case of a context switch it is very important to keep a bookmark of where you need to return to in order to continue. In our team we even did that with a handoff of the task between developers. Extreme Programming, it is. It is interesting to see the surprising results in terms of lines of code. Originally we thought of it as splitting a micro-service from a monolith. In retrospective, it looks to me more like splitting a service into two services. ‘Micro’ in this case is in the eye of the beholder.